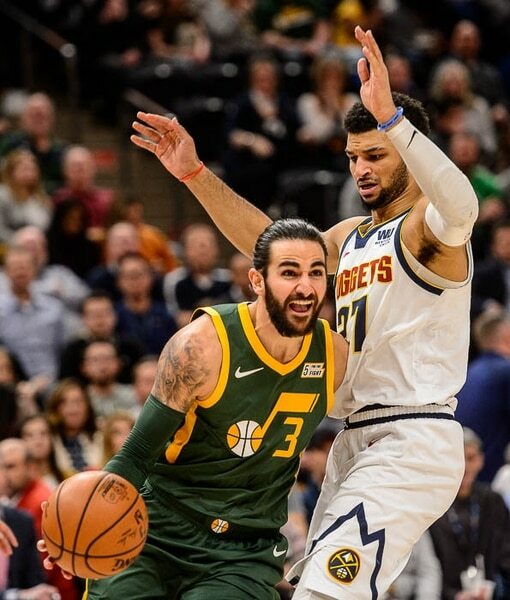 (Trent Nelson | The Salt Lake Tribune) Utah Jazz guard Ricky Rubio (3) and Denver Nuggets guard Jamal Murray (27) as the Utah Jazz host the Denver Nuggets, NBA basketball in Salt Lake City on Wednesday Jan. 23, 2019. (Trent Nelson | The Salt Lake Tribune) Denver Nuggets guard Jamal Murray (27) reaches in on Utah Jazz guard Donovan Mitchell (45) as the Utah Jazz host the Denver Nuggets, NBA basketball in Salt Lake City on Wednesday Jan. 23, 2019. 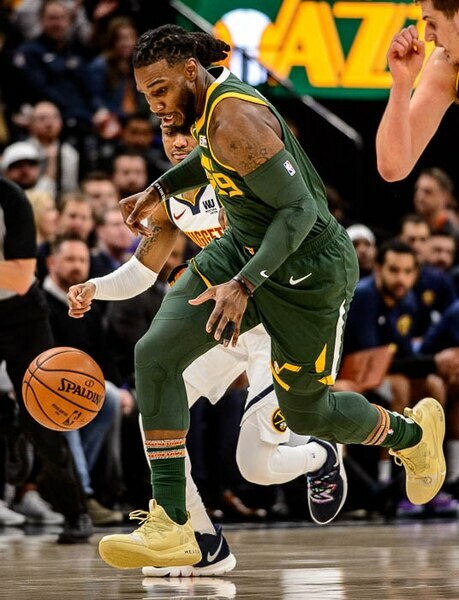 (Trent Nelson | The Salt Lake Tribune) Utah Jazz forward Jae Crowder (99) steals the ball as the Utah Jazz host the Denver Nuggets, NBA basketball in Salt Lake City on Wednesday Jan. 23, 2019. (Trent Nelson | The Salt Lake Tribune) Utah Jazz forward Jae Crowder (99) as the Utah Jazz host the Denver Nuggets, NBA basketball in Salt Lake City on Wednesday Jan. 23, 2019. (Trent Nelson | The Salt Lake Tribune) Utah Jazz center Rudy Gobert (27) defending Denver Nuggets center Nikola Jokic (15) as the Utah Jazz host the Denver Nuggets, NBA basketball in Salt Lake City on Wednesday Jan. 23, 2019. (Trent Nelson | The Salt Lake Tribune) Utah Jazz guard Donovan Mitchell (45) drives to the basket as the Utah Jazz host the Denver Nuggets, NBA basketball in Salt Lake City on Wednesday Jan. 23, 2019. (Trent Nelson | The Salt Lake Tribune) Utah Jazz center Rudy Gobert (27) defending Denver Nuggets forward Paul Millsap (4) as the Utah Jazz host the Denver Nuggets, NBA basketball in Salt Lake City on Wednesday Jan. 23, 2019. (Trent Nelson | The Salt Lake Tribune) Tensions flare between Utah Jazz forward Derrick Favors (15) and Denver Nuggets forward Mason Plumlee (24) as the Utah Jazz host the Denver Nuggets, NBA basketball in Salt Lake City on Wednesday Jan. 23, 2019. (Trent Nelson | The Salt Lake Tribune) Utah Jazz guard Donovan Mitchell (45) and Denver Nuggets forward Paul Millsap (4) as the Utah Jazz host the Denver Nuggets, NBA basketball in Salt Lake City on Wednesday Jan. 23, 2019. (Trent Nelson | The Salt Lake Tribune) Utah Jazz guard Donovan Mitchell (45) drives to the basket as the Utah Jazz host the Denver Nuggets, NBA basketball in Salt Lake City on Wednesday Jan. 23, 2019. (Trent Nelson | The Salt Lake Tribune) Utah Jazz guard Donovan Mitchell (45) drives to the basket as the Utah Jazz host the Denver Nuggets, NBA basketball in Salt Lake City on Wednesday Jan. 23, 2019. (Trent Nelson | The Salt Lake Tribune) Denver Nuggets forward Mason Plumlee (24) loses control of the ball as the Utah Jazz host the Denver Nuggets, NBA basketball in Salt Lake City on Wednesday Jan. 23, 2019. (Trent Nelson | The Salt Lake Tribune) Utah Jazz forward Jae Crowder (99) tries to save the ball as the Utah Jazz host the Denver Nuggets, NBA basketball in Salt Lake City on Wednesday Jan. 23, 2019. (Trent Nelson | The Salt Lake Tribune) Utah Jazz guard Donovan Mitchell (45) chases down a loose ball as the Utah Jazz host the Denver Nuggets, NBA basketball in Salt Lake City on Wednesday Jan. 23, 2019. (Trent Nelson | The Salt Lake Tribune) Utah Jazz center Rudy Gobert (27) blocks a shot by Denver Nuggets center Nikola Jokic (15) as the Utah Jazz host the Denver Nuggets, NBA basketball in Salt Lake City on Wednesday Jan. 23, 2019. (Trent Nelson | The Salt Lake Tribune) Denver Nuggets guard Jamal Murray (27) reaches in on Utah Jazz guard Donovan Mitchell (45) as the Utah Jazz host the Denver Nuggets, NBA basketball in Salt Lake City on Wednesday Jan. 23, 2019. (Trent Nelson | The Salt Lake Tribune) Utah Jazz guard Kyle Korver (26) defended by Denver Nuggets guard Monte Morris (11) as the Utah Jazz host the Denver Nuggets, NBA basketball in Salt Lake City on Wednesday Jan. 23, 2019. (Trent Nelson | The Salt Lake Tribune) Utah Jazz forward Derrick Favors (15) is pushed away from a scuffle as the Utah Jazz host the Denver Nuggets, NBA basketball in Salt Lake City on Wednesday Jan. 23, 2019. (Trent Nelson | The Salt Lake Tribune) Utah Jazz forward Derrick Favors (15) is ejected from the game as the Utah Jazz host the Denver Nuggets, NBA basketball in Salt Lake City on Wednesday Jan. 23, 2019. (Trent Nelson | The Salt Lake Tribune) Utah Jazz center Rudy Gobert (27) dunks over Denver Nuggets center Nikola Jokic (15) as the Utah Jazz host the Denver Nuggets, NBA basketball in Salt Lake City on Wednesday Jan. 23, 2019. (Trent Nelson | The Salt Lake Tribune) Utah Jazz center Rudy Gobert (27) pulls in a rebound as the Utah Jazz host the Denver Nuggets, NBA basketball in Salt Lake City on Wednesday Jan. 23, 2019. (Trent Nelson | The Salt Lake Tribune) Utah Jazz guard Ricky Rubio (3) passes the ball as the Utah Jazz host the Denver Nuggets, NBA basketball in Salt Lake City on Wednesday Jan. 23, 2019. (Trent Nelson | The Salt Lake Tribune) Utah Jazz guard Donovan Mitchell (45) shoots a three-pointer as the Utah Jazz host the Denver Nuggets, NBA basketball in Salt Lake City on Wednesday Jan. 23, 2019. (Trent Nelson | The Salt Lake Tribune) Utah Jazz guard Ricky Rubio (3) celebrates a three-pointer as the Utah Jazz host the Denver Nuggets, NBA basketball in Salt Lake City on Wednesday Jan. 23, 2019. (Trent Nelson | The Salt Lake Tribune) Utah Jazz center Rudy Gobert (27) dunks over Denver Nuggets center Nikola Jokic (15) as the Utah Jazz host the Denver Nuggets, NBA basketball in Salt Lake City on Wednesday Jan. 23, 2019. (Trent Nelson | The Salt Lake Tribune) Utah Jazz guard Donovan Mitchell (45) is fouled by Denver Nuggets guard Monte Morris (11) as the Utah Jazz host the Denver Nuggets, NBA basketball in Salt Lake City on Wednesday Jan. 23, 2019. (Trent Nelson | The Salt Lake Tribune) Denver Nuggets guard Jamal Murray (27) and Utah Jazz forward Royce O'Neale (23) as the Utah Jazz host the Denver Nuggets, NBA basketball in Salt Lake City on Wednesday Jan. 23, 2019. (Trent Nelson | The Salt Lake Tribune) Utah Jazz forward Jae Crowder (99) as the Utah Jazz host the Denver Nuggets, NBA basketball in Salt Lake City on Wednesday Jan. 23, 2019. (Trent Nelson | The Salt Lake Tribune) Utah Jazz forward Joe Ingles (2) shoves Utah Jazz guard Donovan Mitchell (45), celebrating a turnover as the Utah Jazz host the Denver Nuggets, NBA basketball in Salt Lake City on Wednesday Jan. 23, 2019. (Trent Nelson | The Salt Lake Tribune) Utah Jazz guard Donovan Mitchell (45) celebrates a three-pointer as the Utah Jazz host the Denver Nuggets, NBA basketball in Salt Lake City on Wednesday Jan. 23, 2019. (Trent Nelson | The Salt Lake Tribune) Utah Jazz guard Donovan Mitchell (45) recovers a loose ball as the Utah Jazz host the Denver Nuggets, NBA basketball in Salt Lake City on Wednesday Jan. 23, 2019. (Trent Nelson | The Salt Lake Tribune) Utah Jazz forward Jae Crowder (99) makes an improbable shot as he's fouled by Denver Nuggets guard Will Barton (5) as the Utah Jazz host the Denver Nuggets, NBA basketball in Salt Lake City on Wednesday Jan. 23, 2019. (Trent Nelson | The Salt Lake Tribune) Utah Jazz guard Donovan Mitchell (45) and Utah Jazz forward Jae Crowder (99) celebrate as the Utah Jazz host the Denver Nuggets, NBA basketball in Salt Lake City on Wednesday Jan. 23, 2019. (Trent Nelson | The Salt Lake Tribune) Utah Jazz guard Donovan Mitchell (45) defended by Denver Nuggets forward Torrey Craig (3) as the Utah Jazz host the Denver Nuggets, NBA basketball in Salt Lake City on Wednesday Jan. 23, 2019. (Trent Nelson | The Salt Lake Tribune) Utah Jazz guard Donovan Mitchell (45) and Utah Jazz forward Jae Crowder (99) celebrate as the Utah Jazz host the Denver Nuggets, NBA basketball in Salt Lake City on Wednesday Jan. 23, 2019. (Trent Nelson | The Salt Lake Tribune) Utah Jazz forward Jae Crowder (99) celebrates as the Utah Jazz host the Denver Nuggets, NBA basketball in Salt Lake City on Wednesday Jan. 23, 2019. Wednesday’s matchup at Vivint Smart Home Arena between the Jazz and Nuggets had a playoff-type atmosphere to it. Back-and-forth buckets. Heightened intensity. Even an altercation resulting in multiple ejections and several more technicals. In the end, the Jazz capitalized on a franchise-record 13 made 3-pointers in the first half and a couple of dominant stretches from guard Donovan Mitchell to beat back every Denver rally en route to a 114-108 win over the team with the second-best record in the Western Conference. The victory certainly generated some swagger from the team afterward. There certainly was confidence at the game’s start. Joe Ingles showed no hesitation in firing up — and burying — a 3. Ricky Rubio, once again in the starting lineup in his second game back from a hamstring injury, hit a reverse layup-and-one. Then he faked a pass to Derrick Favors to get Denver’s defense leaning, before dishing it to Rudy Gobert cutting in from the other side for an 8-0 advantage. Everyone knew it wouldn’t be that easy, however. And indeed, before the quarter was up, things got intense. At the 2:46 mark, Crowder was whistled for a foul on Nuggets reserve big man Mason Plumlee. Plumlee and Favors then came together, exchanged words, and a physical confrontation ensued under the basket in front of Denver’s bench. When the dust settled and the review was completed, both Favors and Plumlee were ejected, and both Royce O’Neale and Will Barton were assessed technicals. Denver’s star big man, Nikola Jokic, appeared to leave the bench during the scrum, but was not penalized. However, the momentum in the immediate aftermath seemed to favor the Nuggets. They closed to within 30-24 by the end of the first quarter, then began the second on a 7-0 run to take the lead. That’s when the Jazz took their 3-point proficiency to another level: After making five in the first quarter, Utah wound up making eight in the second. Ingles and Korver, the Jazz’s so-called Splash Uncles, each nailed a trio of 3s in the half. Meanwhile, Mitchell caught fire. After scoring just two points on 1-for-3 shooting in the opening 12 minutes, he drained 4 of 5 from deep in the next period, and was up to 16 points by the break. Still, the Jazz couldn’t quite break the game open, despite Denver accumulating just a trio of 3s itself. Then again, the Nuggets didn’t really need the deep shots, the way Jokic — who came into the game averaging 7.7 assists per game — was locating open teammates. Every time an ill-advised double-team came his way, he found somebody, and the Nuggets racked up 36 points in the paint in the opening half. After that, it became a pair of brawlers trading haymakers — figuratively speaking, of course. The Jazz steadily expanded their lead to as many as 15 points in the third. But with Mitchell and Gobert on the bench, the Nuggets clawed their way back to within single digits. By early in the fourth, Utah’s lead was down to four. And coach Quin Snyder had seen enough — sending his star duo back in. They had their intended impact. The big man slowed Denver’s forays to the rim, and made Jokic work in the paint. 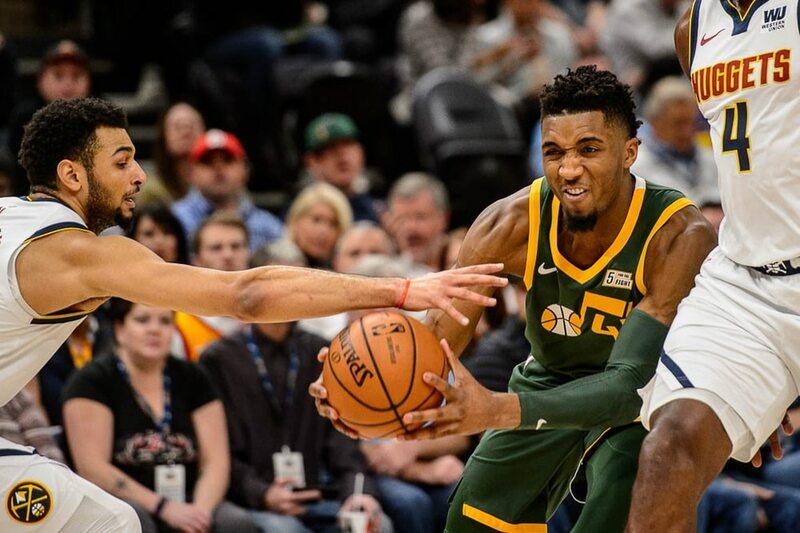 Mitchell, meanwhile, went crazy on offense, utilizing the high pick-and-roll, draining another pair from deep — the second of which bounced three times on the rim before dropping through the cylinder — and before the Nuggets knew what had happened, Mitchell was up to 31 points, and the Jazz lead was back up to a dozen. Mitchell wound up with 35 points, six assists and six rebounds. Gobert finished with 15 points, 11 boards, and three blocks. Rubio totaled 17 points and six assists in just over 24 minutes. Ingles had 14 points and eight assists. Crowder scored 15 off the bench. Jokic, meanwhile kept Denver in it — he finished with 28 points, 21 rebounds, and six assists — as the Nuggets again rallied to win four points with a minute and a half left. But the Jazz responded with big play after big play: A Crowder 3; forcing a five-second inbound violation; Crowder rotating over to stop Jokic and forcing him to pass, Gobert rotating over to make Torrey Craig hesitate on his shot, then Mitchell swooping in from behind to swat the ball away. The game was intense, it was fun, and — from Utah’s perspective — it was productive. Even if it didn’t carry a postseason vibe for all involved.